The Israeli occupation of Palestine is one of the most hotly debated and controversial ongoing crises in Western Asia for the past several decades, resulting in numerous affronts to human rights that have stained the last few generations of those who call the region home. While the differences of opinion over what is to be done and what is ethically correct have never been an easy rift to bridge, it is without a doubt a hotbed of vividly enthralling stories in which filmmakers have taken to the screen in order to cut through the collective propaganda of both sides. To that end, expert documentarian Julia Bacha follows up her 2012 short “My Neighbourhood” with another ardent expose into the heart of life in the Gaza Strip; this time spotlighting activist Naila Ayesh and her significant role in the Palestinian First Intifada uprising. 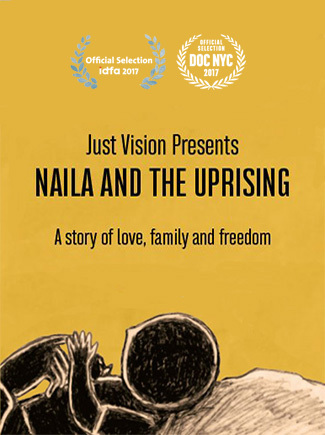 Naila and the Uprising impresses as a home movie at the heart of one of the world’s longest international conflicts, but it possesses flair and a genuine creativity that transforms the hard truths of life in the occupation into a piece of abstract beauty and hope in the face of brutality. The film primarily follows Ayesh recounting exceptional events from her childhood up through the present day to her mantle in the First Intifada, considerably the most effective nonviolent movement in Palestinian history. Through a combination of traditional interviews with Ayesh and her friends, family and colleagues, utilizing stock footage, personal photos and videotape, Bacha crafts a very direct and bleak picture throughout the uprising in the late 1980s, and as to the grave consequences participation in the movement warranted at the hands of the Israeli military. Throughout prison sentences, a miscarriage, the exile of her husband, numerous arrests and murders of demonstrators, and finally concluding with the failed promises of the Oslo Accords, the documentary presents not only the grim realities of what the turbulent time was like, but also the essential nature of the clandestine network of women who finally forced the world to recognize the Palestinian right to self-determine. While focused chiefly on the effects felt by Ayesh, the true subject of the film resides in the female activism, leadership and sacrifice in securing equality and freedom for everyone in the occupied territories. If the film had stopped at its traditional means in which it relays information, it would have been a potent tale, but one that has been previously tread. However, Bacha enlisted the masterful inventiveness of Dominique Doktor and Sharron Mirsky to craft recreations of moments and abstract ideas through animation that echo along the lines of Marjane Satrapi’s “Persepolis,” which in turn deliver the film a grasp to match its reach. This blending of genres and presentations matched by the mournfully elegant score by Tristan Capacchione deliver a chilling experience throughout the majority of the brisk 75-minute runtime. However, though the story is told linearly, the editing by Flavia De Souza and Rebekah Wingert-Jabi constantly becomes disjointed and even sloppy, lacking a succinctness to bridge segments of the work with a razor-sharp efficiency that it requires. What Naila and the Uprising has to say as a whole is utterly significant, but its lopsided arrangement results in a sum less powerful than its individual parts. Acting not as a journalistic investigation per se, Naila and the Uprising possesses enough hard information to back its extraordinary passion, though its final form is less synoptic than required. Its drive to expose the under-told role women have played in preserving and shaping Palestine ultimately serves as an exceptional recognition of the viability of the First Intifada, and as a highlight on the work that is still needs to be done in contemporary Western Asia.